Exclusively for Charlie Car Rental customers! Rent a car with Charlie and reserve your discounted Aquatic Excursion now! Charlie Car Rental partners with Kayaking Puerto Rico, the leading aquatic excursion company specializing in unforgettable Snorkeling Adventures. Discover Puerto Rico's stunning beaches with crystal clear waters for snorkeling or explore Culebra Island and enjoy swimming with turtles. An ADVENTURE of a Lifetime! Pilot your own 40 hp MINI BOAT among Deserted Cays & Snorkel the crystal clear waters off Fajardo’s eastern coast! » For more Information on the Mini Boat Island Hop Snorkel & Beach tour in Fajardo, Puerto Rico. $74 per person - regular price $79 pp. That's a $5 savings per person! 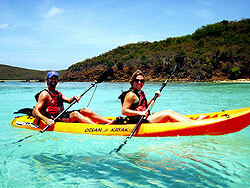 Enjoy a kayaking and snorkeling DAY TRIP adventure to Puerto Rico's best beaches at Culebra Island. 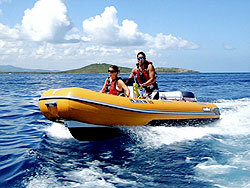 Without a doubt the Culebra Aquafari is an amazing Excursion. The clearest waters, pristine beaches and a variety of sea-life that will amaze! Cost includes Roundtrip Ferry ride from PR mainland in Fajardo...and more! » For more Information on the Culebra Island Beach & Snorkeling Kayak tour in Fajardo, Puerto Rico. Please mention this Charlie Car promotion! Reservations must be made in advance. To qualify, guests must present Charlie Car Rental Key Chain (or rental agreement) to Kayaking Puerto Rico staff person prior to excursion launch. This promotion cannot be combined with any other existing Kayaking Puerto Rico discounted offer or promotion. © Copyright 2010 Fenn Design All Rights Reserved.